I Voted, originally uploaded by kendrak. Alameda County is really big. It’s also really diverse with over 40% of the households speaking a language other than English at home. This makes bilingual election material vital to keep democracy open and fair within the county. In 2010 the Asian Law Caucus observed the election and noted problems throughout the Bay Area, including Alameda County. To their credit, Alameda took these issues seriously and made some big changes for this election – they gave more resources to language assistance and made sure all polling locations had signage, sample ballots, and ballots in the five official languages: English, Spanish, Mandarin, Vietnamese, and Tagalog. All ballots were bilingual with English. The main message of the poll worker classes I attended was to be sure we provided at all precincts, to alternate English/Spanish and English/Chinese ballots, and tried to place bilingual poll workers at locations. It was a little confusing for some, particularly people over 60, but I really liked the inclusive spirit. 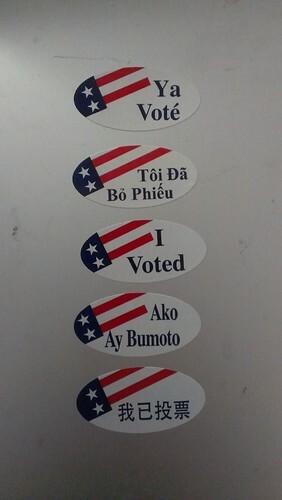 I thought it was great that they also provided the ‘I Voted” stickers in all the languages – a simple reflection of our multicultural county. It’s not to say that people who live in the Berkeley and Oakland Hills are bad, but there really is a different mentality. They’re in their own bubble, and listening to some of the comments about the bilingual ballots and the signage made me happy to not be in it. “Why does it even matter? Nobody here speaks… what’s that language? Tag-a-long? Where is that from?” Yeah… a poll worker said that to me. They had been to the same classes (where the languages were explained), and this person is ostensibly educated and of the world (they talked about a week just spent in New York, and other trips abroad), but they jokingly dismissed Filipinos in our county. This person also assumed Vietnamese people just spoke French. It gave me a headache. I reminded all the poll workers that regulations required that all signs were posted, and we had the ballots on hand just in case. One one precinct took these changes in stride (we have changes every election), the other two seemed to find these changes to be a burden and it definitely rubbed me the wrong way. The obliviousness that perhaps other parts of the county, like Downtown Oakland, Fruitvale, parts of Fremont and Hayward could really benefit from these changes smacked of entitlement. I’ll admit to joking that I would never move south of Lake Merritt, but I know it exists and that there are lots of people there who have the right to vote. The jokes illustrating ignorance and indifference to the immigrant minority populations in the Bay Area registered a mix of entitlement and classism. When one voter talked about giving the “Tới Đầ Bỏ Phiếu” sticker to their “Vietnamese house girl”. Nice gesture. I think there is room for refinement with the ballots themselves, but posting signage and sample ballots is a pretty small burden. I hope by November everybody is on board with it, and if they can’t cope with that, perhaps it’s time for a new generation of poll workers? It’s not just a fun day out where we see our neighbors, it’s really a day where we serve our community so they can vote. The whole community, not just those who live in our zipcode or socioeconomic strata. You make a Dad proud!